How do you buy My Artwork? I use PayPal as my payment processor. 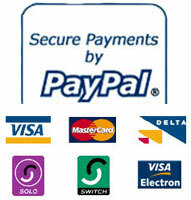 It is one of the most preferred payment methods on the internet. You are not obligated to sign up with PayPal, so you can also just make a onetime purchase using your favorite creditcard. To make a purchase simply click on the Buy it now button you go to the Secure Paypal Checkout page (web page loads in a seperate page) where you can either purchase with your chosen cresit/debit card or use your Paypal account. All Prints are either A2 or A3 size, mounted on card with NO frame on high quality paper using Giclee ink which is also high quality. Please note that Print only means that the original has been sold.